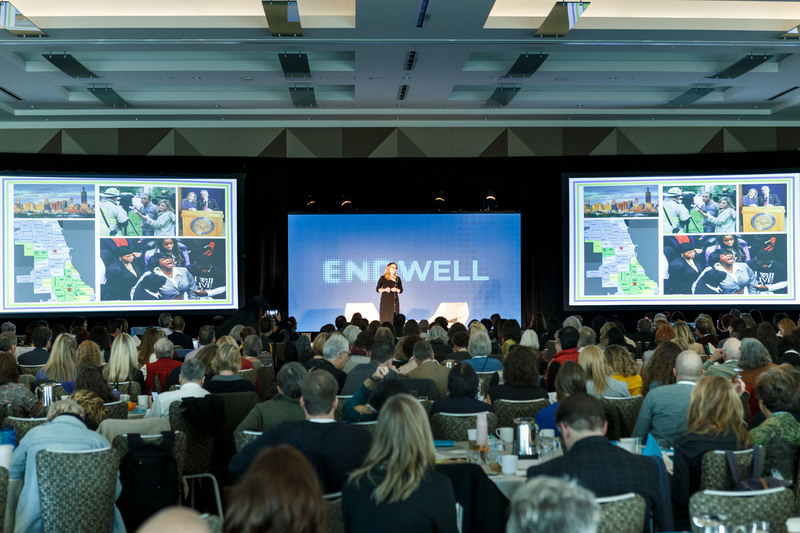 The End Well Symposium is a day-long series of keynote-style talks about palliative care and end of life design. The End Well Symposium was conceived by Shoshana Ungerleider, MD. She started the Underleider Palliative Care Education Fund which supports palliative care education in different capacities. The speakers spanned across many different industries including healthcare, architecture, policy, film, media, technology and more. The symposium drew a multi-disciplinary audience of 400 attendees all passionate about changing the conversation around the end of life. Role: Lead producer working closely with Wellhaus Media who led the event strategy, program curation and branding. Musician, Yoko Sen shared how her hospital stay impacted her to find ways to incorporate music and sound to the hospital experience. Cynthia Perillat Carter gave us insight into how caregivers need to also be cared for and how her organization supports them. Torrie Fields shared her story of being diagnosed with cervical cancer and being uninsured and how that pushed her to advocate for better policy that support the sick. It was truly an eye-opening and moving experience to be a part of this day. I have so much admiration for Shoshana, Wellhaus Media and the speakers who brought their gifts and hearts to making this an unforgettable and impactful day.